Workshops in my Studio.-Textile Art by Marion Browning.B.A. hons. 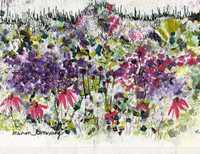 I have a garden studio in St. Mary Bourne, near Andover, where I give one to one tuition on free machine embroidery, collage and reverse applique. There is a project guide to give ideas on what is available. Whether you are a complete beginner or more advanced, maybe even having work that you have started and need help with. Bring your sewing machine and have some fun. It would be helpful if you could bring along some ideas on the subjects that interest you in the form of photos or sketches. If you would like to book, please send a message via my contact page.